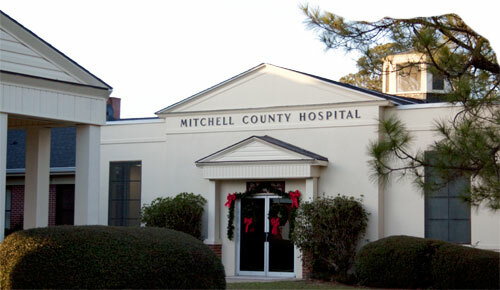 Mitchell County residents and visitors have some of the finest health care services in South Georgia courtesy of Archbold Medical Center which is a four-hospital, three nursing-home system with 540 beds. Since 1925, Archbold has been serving patients with high-quality, compassionate medical care. Some of their services include behavioral health, heart and vascular, rehabilitation, and dialysis’. Archbold Medical Center is 30 miles south of Mitchell County. Mitchell County Hospital, a 25 bed facility, Mitchell Convalescent Center, a 48 bed facility, and Pelham Parkway Nursing Home, a 108 bed facility, became affiliated with John D. Archbold Memorial Hospital in 1990. 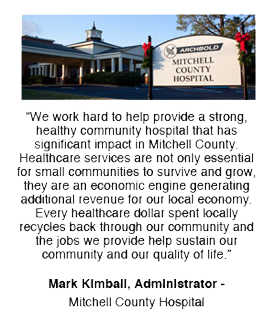 Another result of the affiliation allows Mitchell County Hospital to participate in efficient, multi-hospital system that delivers quality health care at the lowest possible cost. For more information visit Archbold Medical Center. Mitchell County also has access to Phoebe Putney Memorial Hospital, which is about 30 minutes north of the county. Phoebe Putney, a health care provider since 191 1, is a network of hospitals, family medicine clinics, rehab facilities, auxiliary services, and medical education training facilities. Phoebe is one of Georgia’s largest comprehensive regional medical centers. The location, is a 443 bed teaching hospital and a regional center for cancer and cardiac medicine. For more information visit Phoebe Putney Memorial Hospital.